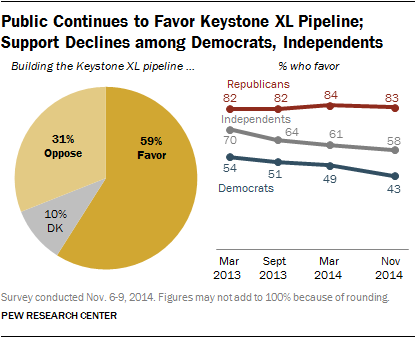 A solid majority of Americans support building the Keystone XL pipeline, although support has slipped. By nearly two-to-one (59% to 31%), the public favors building the pipeline, which would carry crude from Canadian oil sands to ports on the U.S. Gulf Coast, according to a November 2014 survey. Yet overall support is down from March 2013 when 66% favored the project. Support has held firm among Republicans (83% in favor) but declined among Democrats (43%) and independents (58%). While Democratic support for building the pipeline has fallen, Democrats remain internally divided over its construction. Support for the increased use of fracking has declined. Overall, 41% favored the increased use of fracking to extract oil and natural gas from underground rock formations while 47% are opposed, according to last November’s poll. In March 2013, there was more support (48%) than opposition (38%) to increased use of the drilling technique. Republicans support increased fracking far more than Democrats, by a 62% to 29% margin. There was a particularly dramatic change of views in the Midwest where increased use of fracking is now opposed by a 47% to 39% margin compared with the majority who favored its use in 2013. The substantial growth in U.S. energy production has done little to change public attitudes about energy policies. 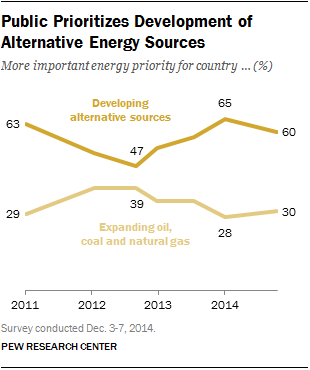 In broad terms, developing alternative energy is viewed (by 60% to 30%) as a more important priority than expanding the exploration and production of oil, coal and natural gas, according to a December 2014 survey. Yet when asked about specific policies to address the energy supply, a majority of Americans continue to support allowing more offshore oil and gas drilling in U.S. waters (56%) and more mining and drilling on federally owned land (58%) — opinions largely unchanged from previous years. About eight-in-ten (81%) Americans support requirements for better fuel efficiency for cars and trucks. There is broad public support for stricter limits on power plant emissions. About two-thirds (64%) of the American public said in a November survey that they favored stricter limits on power plant emissions to mitigate climate change, while a 31% minority opposed stricter limits on emissions. 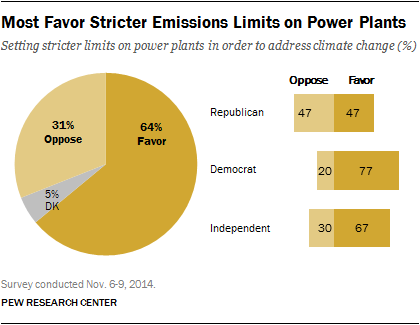 Views on regulating emissions were divided along partisan lines. Democrats were far more supportive than Republicans of stricter emission limits on power plants to address climate change. Nearly eight-in-ten Democrats (77%) favored these measures compared with 67% of independents. Among Republicans, as many said they opposed as said they favored these efforts (47% each). There is strong public support for efforts to protect the environment, but many question the costs. Environmental protection draws more support in principle than when the issue of potential costs is raised. Among the public, 71% said the country “should do whatever it takes to protect the environment,” according to a January-March 2014 survey. But a smaller majority (56%) said “stricter environmental laws and regulations are worth the cost.” Nearly four-in-ten (39%) said tougher environmental laws and regulations cost too many jobs and hurt the economy. There are sharp partisan divides on these questions. Democrats overwhelmingly, by eight-to-one, said that the country should do whatever it takes to safeguard the environment while Republicans are almost evenly divided. About seven-in-ten (71%) Democrats believe stricter environmental laws are worth the cost compared with just 37% of Republicans. Nearly six-in-ten Republicans (59%) said stricter environmental laws and regulations have a negative economic impact. 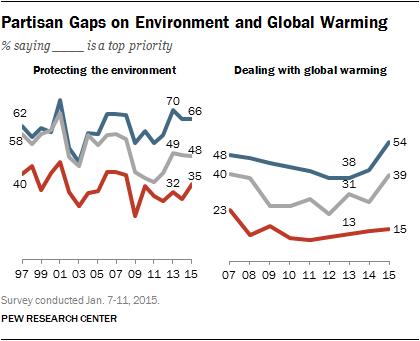 Some of the largest partisan gaps when it comes to the public’s priorities are over the environment. The partisan divide over dealing with global warming is especially striking. A January survey found 54% of Democrats view this as a top priority for the president and Congress compared with just 15% of Republicans. Democrats also are 31 points more likely than Republicans to prioritize protecting the environment (66% of Democrats vs. 35% of Republicans). See our overview on President Obama’s 2015 State of the Union, and read our related fact sheets on immigration, the economy, and privacy and cybersecurity.